When Intel launches its 10nm Cannon Lake (CNL) and Ice Lake (ICL) processors for consumers it is now expected that they will come packing Advanced Vector Extensions (AVX) 512 instruction compatibility. Anton Shilov from tech site AnandTech discovered that an update to the Intel document for software developers now indicates that AVX-512 and a host of other new non-AVX-512 instructions will be supported by the next gen Intel CPUs sold to mainstream consumers. AVX-512 was primarily designed to process large amounts of data, thus targeting servers and, to a lesser degree, workstations. This is why the exptensions first appeared in Intel's top-end powerful Xeon Phi processors.The extensions, which are numerous and include AVX512F, AVX512CD, AVX512DQ, AVX512BW, and AVX512VL, can provide significant benefits to activities like encoding, rendering, cryptography, and deep learning. However consumer programs will have to be updated to support AVX-512, to tap into the benefits. It’s uncertain whether the AVX-512 extensions will be kept in reserve for higher-end consumer desktop processors, like Core i7 CPUs or 'Exteme Edition' consumer CPUs. AnandTech notes that these extensions carry a weight of sorts; adding the extensions has previously resulted in double digit percentage die size increases, extra costs, and also currently lack of consumer applications support. The Intel Architecture Instruction Set Extensions and Future Features Programming Reference document (PDF) has been published ahead of its hardware releases to allow developers to prepare apps for the arrival of these CPUs with AVX-512. 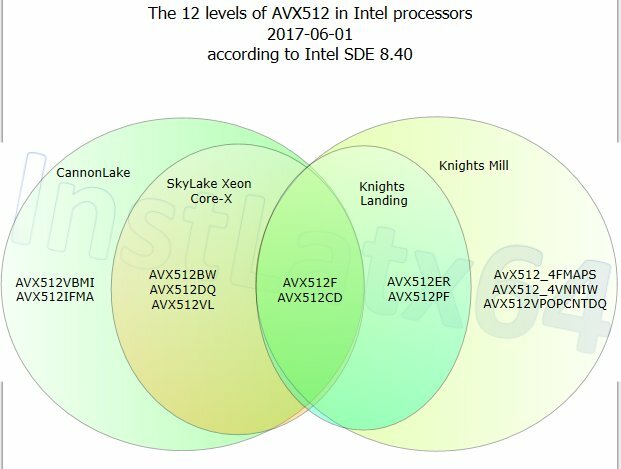 As well as referring to the above document, the AnandTech linked article provides at-a-glance tables showing the propagation of AVX-512 support through various Intel CPU product tiers and generations. Only a limited amount of things Intel can yo in an attempt to combat Ryzen (thingscthey can market) in the short term. what is AMD's alternative to AVX512? If people read the article carefully,you will notice multiple different versions of AVX512 - this is because the versions used by CPUs and Intel's own accelerator cards do not necessarily overlap,and it has been segmented massively dependent on SKU. Its also been known for a while Cannonlake would get AVX512. So I wonder if this will mean Intel,will try and standardise AVX512 versions moving forwward?? AMD current alternative to AVX256 is a version of FMA,AFAIK,but Ryzen does AVX256 at a lower throughput than Intel CPUs,as apparently it does take up a reasonable amount of die area to implement,and AMD uses a smaller physical core than SKL/KL/CFL. AFAIK,they don't support AVX512 but it is very niche currently - even AVX256 support is not very common in a lot of consumer/commercial applications but a some do and Intel is noticeably faster. For games I am uncertain how much it will make a difference though - AFAIK,the consoles can only run AVX like applications in 128 bit,so don't support 256 bit and 512 bit very well. The new Ryzen processor from AMD represents a complete redesign of the CPU microarchitecture. This is the first of a series of “Zen” architecture processors. I must say that this redesign is a quite successful one which puts AMD back in the game after several years of lagging behind Intel in performance. The Ryzen has a micro-operation cache which can hold 2048 micro-operations or instructions. This is sufficient to hold the critical innermost loop in most programs. There has been discussions of whether the Ryzen would be able to run four instructions per clock cycle or six, because the documents published by AMD were unclear at this point. Well, my testing shows that it was not four, and not six, but five. As long as the code is running from the micro-operations cache, it can execute five instructions per clock, where Intel has only four. Code that doesn't fit into the micro-operations cache run from the traditional code cache at a maximum rate of four instructions per clock. However, the rate of fetching code from the code cache is not 32 bytes per clock, as some documents seem to indicate, but mostly around 16 bytes per clock. The maximum I have seen is 17.3 bytes per clock. This is a likely bottleneck since most instructions in vector code are more than four bytes long. The combination of a compare instruction and a conditional jump can be fused together into a single micro-op. This makes it possible to execute a tiny loop with up to six instructions in one clock cycle per iteration. Except for tiny loops, the throughput for jumps is one jump per two clock cycles if the jump is taken, or two not-taken jumps per clock cycle. 256-bit vector instructions (AVX instructions) are split into two micro-ops handling 128 bits each. Such instructions take only one entry in the micro-operation cache. A few other instructions also generate two micro-ops. The maximum throughput of the micro-op queue after the decoders is six micro-ops per clock. The stream of micro-ops from this queue are distributed between ten pipelines: four pipes for integer operations on general purpose registers, four pipes for floating point and vector operations, and two for address calculation. This means that a throughput of six micro-ops per clock cycle can be obtained if there is a mixture of integer and vector instructions. Let us compare the execution units of AMD's Ryzen with current Intel processors. AMD has four 128-bit units for floating point and vector operations. Two of these can do addition and two can do multiplication. Intel has two 256-bit units, both of which can do addition as well as multiplication. This means that floating point code with scalars or vectors of up to 128 bits will execute on the AMD processor at a maximum rate of four instructions per clock (two additions and two multiplications), while the Intel processor can do only two. With 256-bit vectors, AMD and Intel can both do two instructions per clock. Intel beats AMD on 256-bit fused multiply-and-add instructions, where AMD can do one while Intel can do two per clock. Intel is also better than AMD on 256-bit memory writes, where Intel has one 256-bit write port while the AMD processor has one 128-bit write port. We will soon see Intel processors with 512-bit vector support, while it might take a few more years before AMD supports 512-bit vectors. However, most of the software on the market lags several years behind the hardware. As long as the software uses only 128-bit vectors, we will see the performance of the Ryzen processor as quite competitive. The AMD can execute six micro-ops per clock while Intel can do only four. But there is a problem with doing so many operations per clock cycle. It is not possible to do two instructions simultaneously if the second instruction depends on the result of the first instruction, of course. The high throughput of the processor puts an increased burden on the programmer and the compiler to avoid long dependency chains. The maximum throughput can only be obtained if there are many independent instructions that can be executed simultaneously. This is where simultaneous multithreading comes in. You can run two threads in the same CPU core (this is what Intel calls hyperthreading). Each thread will then get half of the resources. If the CPU core has a higher capacity than a single thread can utilize then it makes sense to run two threads in the same core. The gain in total performance that you get from running two threads per core is much higher in the Ryzen than in Intel processors because of the higher throughput of the AMD core (except for 256-bit vector code). The Ryzen is saving power quite aggressively. Unused units are clock gated, and the clock frequency is varying quite dramatically with the workload and the temperature. In my tests, I often saw a clock frequency as low as 8% of the nominal frequency in cases where disk access was the limiting factor, while the clock frequency could be as high as 114% of the nominal frequency after a very long sequence of CPU-intensive code. Such a high frequency cannot be obtained if all eight cores are active because of the increase in temperature. AMD has a different way of dealing with instruction set extensions than Intel. AMD keeps adding new instructions and remove them again if they fail to gain popularity, while Intel keeps supporting even the most obscure and useless undocumented instructions dating back to the first 8086. AMD introduced the FMA4 and XOP instruction set extensions with Bulldozer, and some not very useful extensions called TBM with Piledriver. Now they are dropping all these again. XOP and TBM are no longer supported in Ryzen. FMA4 is not officially supported on Ryzen, but I found that the FMA4 instructions actually work correctly on Ryzen, even though the CPUID instruction says that FMA4 is not supported. Detailed results and list of instruction timings are in my manuals: www.agner.org/optimize/#manuals. Cannon lake and Z390. i'm in.